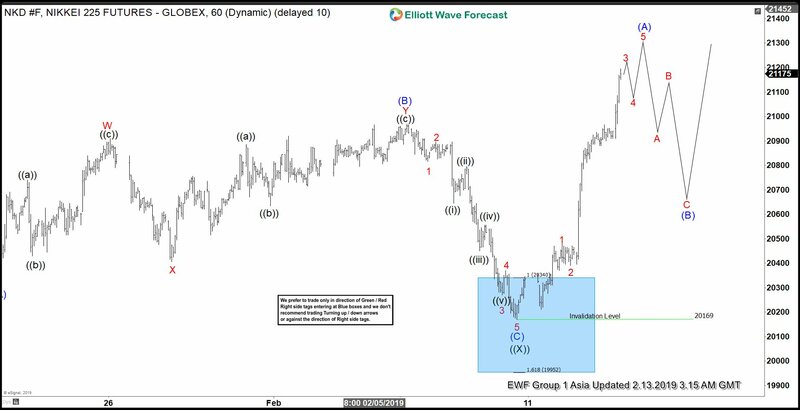 Short-term Elliott wave view in Nikkei suggests that the Index has ended correction at 20169 as wave ((X)) and starts a new leg higher. Decline to 20169 on 8 February took the form of an Elliott Wave Expanded Flat. An Elliott Wave Flat structure has an ABC label with subdivision of 3-3-5. We can see from the 1 hour chart wave (B) of this FLAT ended at 20970 and wave (C) ended at 20169. Subdivision of wave (C) unfolded as a 5 waves Impulse Elliott Wave structure. Down from 20970, wave 1 ended at 20815, and wave 2 ended at 20895. Wave 3 ended at 20270, wave 4 ended at 20370, and wave 5 ended at 20169. The Index has since rallied and broke above the previous high on February 5th, suggesting the next leg higher has started. Rally from Feb 9th low (20169) is unfolding as a 5 waves Impulse structure. Up from 20169, wave 1 ended at 20480 and wave 2 ended at 20390. Expect a few more legs higher in the Index to end the 5 waves up. Afterwards, it should pullback to correct the cycle from Feb 9 low within wave (B) in 3, 7, or 11 swing. As far as pullback stays above 20390 low, expect the Index to extend higher. We don’t like selling the Index.